A. At the time I was reading the book in August we were not buying any groceries for the month. B. We didn’t have a meat grinder or a sausage stuffer. C. There are a few specialty items you need like sausage casings. I went to every grocery store I could find looking for pork fat to add to the sausage but no one carried it. Finally, I tried a mexican Carniceria which is where I should have started in the first place. I asked the butcher if they had pork fat and he said sure, how much? He came back with a big bag. Score! 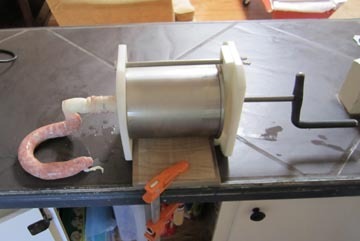 I ended up making 15 lbs of sausage that weekend. Itallian sausage, tomato basil chicken sausage and breakfast sausage. It all turned out delicious. Flavoring and grinding the meat was easy but stuffing the sausage casings turned out to be a real pain. 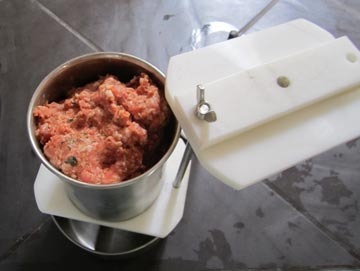 In theory, one stuffs the ground sausage filling into the hopper and the screw of the grinder forces the filling into a casing which has been fed onto the stuffer tube. That’s nice, but in practice it’s very awkward to be trying to shove meat down the hopper with one hand and helping the casing along with the other all at chest height. 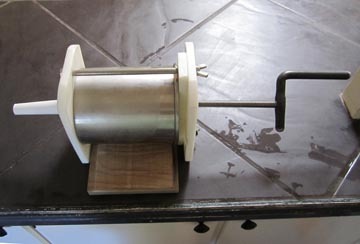 The motorized feeder isn’t forgiving and the whole experience was generally annoying. I swore (colorfully) I would have a better stuffing set up the next time I made sausage. 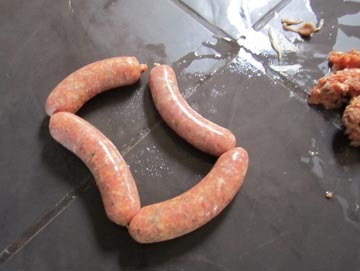 There are several commercial stand-alone sausage stuffers on the market. The ones on the sausage specialty sites were over $300. I did find one on Northern Tool but it was still $99 + shipping. I decided to make my own stuffer. I wanted an inexpensive, easy to use stuffer that would also be easy to clean and break down for storage. I ended up going with a horizontal design as opposed to the vertical design that seems prevalent with the commercial models. I found a $10 stainless steel cylindrical utensil holder at Bed Bath and Beyond that was perfect for the body of the stuffer. All I had to do was cut a hole in the bottom with a hole saw. 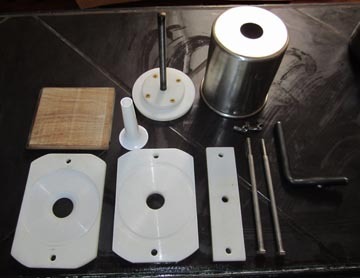 I made the plunger, top and bottom parts from HDPE which is what those white plastic cutting boards are made out of. I got some help from my friend PJ (who happens to be a blacksmith) in making an awesome wrought iron handle for the plunger. A couple stainless steel bolts and wingnuts complete the assembly. The wooden block has a groove in it that sits on the lower bolt and is clamped to the counter to provide stability. Since I had the plastic and some of the hardware the total cost was only about $15. The test run went very well. It was easy to fill and use. Below are some pictures from the stuffer’s inaugural session. After the filling has been ground and mixed it goes into the stuffer. The canister holds 6lbs of meat no problem. Once it’s filled, the stuffer is closed up and turned on it’s side. The wood block is clamped to the counter and holds everything securely. 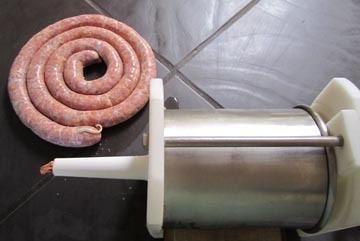 A sausage casing is threaded onto the tube, you slowly turn the handle and the filling is forced into the casing. You don’t want to fill the casing too tightly or else you won’t be able to twist it into links. One of the things I like about sausage is that it was developed as a way to use all the little bits left over from butchering an animal. It was a practical solution that provided delicious results. 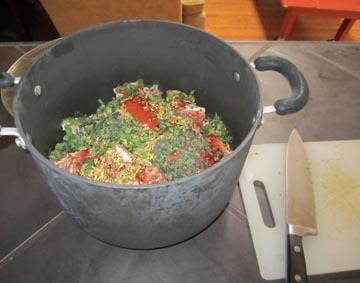 Doing it at home helps me to connect to a history of food that didn’t have anything to do with pre-cut meat packed in a Styrofoam tray. There is a plethora of different sausages from cultures all over the world. Now that I have my tools and process set up I can’t wait to explore them.